Ryan Timothy Tannehill III (born July 27, 1988) is an American football quarterback for the Miami Dolphins of the National Football League (NFL). He was drafted by the Dolphins eighth overall in the 2012 NFL Draft. He played college football at Texas A&M. In track & field, Tannehill competed in the hurdling and jumping events. At the 2006 District 4-4A Championships, he placed third in the 300m hurdles (41.24 s) and earned a second-place finish in the triple jump event (13.19 m). Tannehill redshirted his first season (2007) at Texas A&M turning down offers from the University of Houston, TCU, Tulsa, and UTEP. Before Tannehill's second season, Mike Sherman took over as head coach. In summer camp, Tannehill competed against veteran quarterback Stephen McGee and redshirt sophomore Jerrod Johnson for the starting quarterback position. He finished third in the contest, behind Johnson and then McGee. Sherman, whose offense utilizes true receivers, moved him to wide receiver. In his fifth game, he posted freshman school records of 210 yards on 12 catches. After his six receptions for 78 yards in the Iowa State game, he broke the freshman school records for receptions and receiving yards. Tannehill finished his redshirt freshman season with 844 receiving yards, which was 11 yards shy of breaking Robert Ferguson's record set in 2000. He attempted only one pass at quarterback the whole season. Tannehill had expressed his desire to become the starting quarterback at A&M: "I still think of myself as a quarterback, I still want to be a quarterback here at A&M. Hopefully that's the way it turns out. But if things don't happen that way, and Coach thinks I can better help being a receiver, then I guess I'm okay with that." During the 2009 offseason, Tannehill and Jerrod Johnson competed for the starting quarterback position; the job went to Johnson. Tannehill finished the 2009 season with a team-leading 46 receptions for 609 yards and four touchdowns. About 80% of his 46 catches went for first downs or touchdowns. He picked up All-Big 12 Honorable Mention honors for his performance. He only took eight snaps at quarterback the entire season. Tannehill continued to play receiver during the first six games of the 2010 season. Over those six games, he made 11 catches for 143 yards. He attempted 4 passes during the season opener. He saw extensive action at quarterback during the Kansas game, splitting time with starter Jerrod Johnson. Tannehill finished with 12 completions on 16 attempts for 155 yards and three touchdowns. In his first career start at quarterback, Tannehill led the Aggies to a 45–27 victory over Texas Tech. He set a school record with his 449 passing yards. He also made a 33-yard pooch punt, his first career kick. Tannehill quarterbacked the Aggies to a victory over No. 11 Oklahoma, which moved the team into the top 25. He helped the team maintain the top 25 ranking through victories over Baylor and No. 9 Nebraska. During the Nebraska game, he punted twice since the starter was injured. He and his team defeated Texas to finish off the regular season. Tannehill was recognized with All-Big 12 Honorable Mention honors. In 2011, Tannehill started all 13 games (including the bowl game) at quarterback for the Aggies and served as team captain. He threw for 3,744 yards and 29 touchdowns, with 15 interceptions. He completed 61.6% of his passes and posted a quarterback rating of 133.2. He also ran for 3 touchdowns. Tannehill lost the final game of the regular season to the University of Texas on Thanksgiving Day. Tannehill concluded his quarterback career at Texas A&M with a total of 5,450 passing yards 42 Touchdown passes and 21 interceptions. "I have him rated as the 19th best player in the draft, which tells you I don't think he's ready to be a heavy contributor this year. I watched every throw he made on tape this year. All the out-breaking routes are phenomenal. Where he gets in trouble are the in-breaking routes where he stares the receiver down, pats the ball and throws interceptions." Tannehill ran the 40-yard dash in 4.58 seconds at his pro day. He was considered the #3 quarterback prospect in the 2012 NFL Draft class behind Andrew Luck and Robert Griffin III. In the 2012 NFL Draft, the Miami Dolphins selected Tannehill with the 8th overall pick. He was the first quarterback selected by the Dolphins in the first round since Dan Marino in 1983. He became the 17th starting quarterback by the Miami Dolphins since Marino and only the third quarterback taken in the first round in franchise history, after Hall of Famers Bob Griese and Marino. On July 28, 2012, Tannehill signed his four-year rookie contract with the Dolphins worth approximately $12.688 million, with a 5th-year option. On August 20, 2012, Tannehill was named the starting quarterback for the season opener against the Houston Texans. 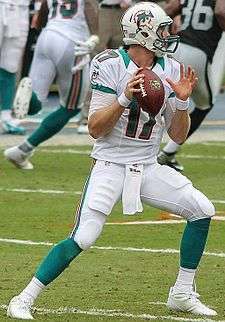 In week 1 of the 2012 NFL season, Tannehill started his first career regular season game which ended in a 30–10 loss. He finished with 219 yards, zero touchdowns and three interceptions. Two of his three interceptions were tipped at the line of scrimmage by defensive end J. J. Watt of the Houston Texans. 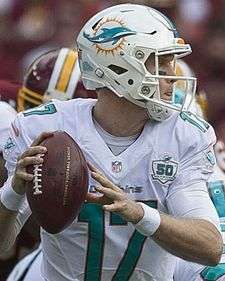 In response to Tannehill's performance, Joe Philbin stated "We've (also) got to do a better job in (pass) protection, and at times the receivers have to protect the throw from the quarterback. So I would say, as is usually the case, there is a little bit of culpability across the board." In week 2 of the 2012 NFL season, Tannehill improved dramatically in a 35–13 win over the Oakland Raiders. Tannehill passed for an even 200 yards, with one touchdown and zero interceptions, as well as 14 yards on the ground to go along with one rushing score. Tannehill seemed to fix his tipped ball problem by having zero passes batted down in week 2. By the end of week 3, Tannehill had completed less than 53% of his passes, and also had only 1 touchdown to four interceptions. In week 4 against the Arizona Cardinals, Tannehill threw for 431 yards, surpassing the Dolphins' single-game record for most passing yards by a rookie quarterback, set by Dan Marino in 1983. Tannehill's mark was 1 yard shy of the NFL's single-game passing-yard record by a rookie quarterback, set by Carolina's Cam Newton in 2011. He threw for 1 touchdown and 2 interceptions in the 24–21 overtime loss to the Cardinals. In week 16, Tannehill set a franchise record for longest run by a quarterback by rushing 31 yards in a single play. The previous record was set by Pat White who had a 30-yard run during the 2009 season. During that week 16 game against Buffalo, Tannehill also became the fifth quarterback in team history to surpass 3,000 passing yards in a season. Tannehill went on to set franchise rookie records for passing yards, attempts, and completions. In Week 1, Tannehill started his 2nd season on the road against the Browns. He went 24/38 for 272 yards a touchdown, an interception, and was sacked 4 times in the 23–10 win. In Week 2, Tannehill and his Dolphins traveled to Indianapolis to take on the offense led by Andrew Luck, also a 2nd-year QB. Tannehill went 23/34 for 319 yards for a touchdown but also was sacked 5 times and lost a fumble in the 24–20 win. In Week 3, Tannehill went home for the first time, taking on the Falcons. He went 24/35 for 236 yards for 2 touchdowns, an interception, got sacked 5 times and lost a fumble in the close 27–23 win. He led his team to a 3–0 start for the first time since 2002. In Week 4, the young QB struggled on the road against the Saints. He went 22/35 for 249 yards and also a touchdown pass, but also committed 4 team turnovers as he was intercepted 3 times and lost a fumble. He was sacked 4 times in the 38–17 loss. In Week 5, he and his team headed back home to take on the Ravens. His team could not hold on after leading 13–6 at halftime. He went 21/40 for 307 yards and threw a touchdown, and was also sacked 6 times in the 26–23 loss. In Week 7, Tannehill went 19/37 for 194 yards and threw 3 touchdown passes, 2 interceptions and lost a fumble while being sacked twice in the 23–21 home loss to the Bills. In Week 8, Tannehill and the Dolphins traveled to Foxborough to take on the Patriots as he went 22/42 for 192 yards throwing 2 touchdowns, 2 interceptions, losing a fumble, and being sacked 6 times in the 27–17 loss. In Week 9, the Dolphins traveled back home to take on the Bengals. Tannehill went 20/28 for 208 yards with a 1-yard TD run despite being sacked 6 times due to the tottering offensive line in the 22–20 win in OT. In Week 10, the Dolphins traveled to take on the winless Buccaneers. Tannehill went 27/42 for 229 yards while throwing 2 touchdowns, one interception, and two sacks in the 22-19 loss. In week 11, the Dolphins took on the San Diego Chargers at home. Tannehill completed 22 of 35 pass attempts for 268 yards, with one touchdown and one interception in a 20-16 win, despite being sacked 4 times. In week 12, the Dolphins hosted the Panthers in a 20-16 loss. Tannehill got his first of two consecutive 300 yard games, completing 28 out of 42 attempts for 310 yards. He was sacked 3 times. In week 13, the Dolphins were at the New York Jets. For the second consecutive week Tannehill topped the 300 yard mark with 331 yards, going 28 of 43, with 2 TD's, one interception, and one sack to notch the 23-3 win. In week 14, the Dolphins traveled to Pittsburgh to take on the Steelers. Tannehill completed 20 of his 33 attempts with 3 TD's, one interception, 2 sacks in a 34-28 win. In week 15, the Dolphins hosted the New England Patriots. Tannehill had his best game of the year, going 25 of 37 for 312 yards with 3 TD's and no INT's. He was sacked 4 times in the 24-20 win. In week 16, the Dolphins were on the road to take on the Buffalo Bills. Tannehill followed up his best game with a lackluster performance going 10 of 27 for a paltry 82 yards. He was sacked 7 times in the 19-0 loss. In week 17 the Dolphins hosted the Jets. Tannehill went 20 of 40 for 204 yards, one TD, 3 interception, and 0 sacks in the 20-7 loss. This was the only regular season game in which Tannehill was not sacked. Mike Sherman was the Dolphins' offensive coordinator in Tannehill's first two NFL seasons, and was the head coach at Texas A&M when Tannehill played there. However, during the 2014 offseason, the Dolphins hired new offensive coordinator Bill Lazor, giving Tannehill a new playbook to learn for the first time since high school. On May 18, 2015, Tannehill signed a 6-year $96 million contract extension with the Dolphins through the 2020 season, making him a unrestricted free agent on 2021. In an October 25, 2015 victory over the Houston Texans, Tannehill became the 64th quarterback in NFL history to post a perfect 158.3 passer rating. In the same game, Tannehill set the all-time NFL record for consecutive completed passes with 25, completing his first 18 passes of the game and the final 7 of his previous game. Four days later, during a Thursday Night game, Tannehill had a rough output, throwing 2 interceptions and 0 touchdowns in a 36-7 loss to the New England Patriots. On December 6, Tannehill became the fourth quarterback in NFL history to throw for over 3,000 yards in each of his first four seasons in the league. On December 15, Tannehill threw for 236 yards and one touchdown in the Dolphins' 31-24 loss to the New York Giants on Monday Night Football. The loss eliminated the Dolphins from the playoffs for the seventh consecutive year. Tannehill graduated with a bachelor's degree in biology in May 2011 and had planned to become an orthopedic surgeon specializing in knee injuries. Ryan and his wife Lauren Ashley Tannehill, whom he met in Panama City in 2009, married on January 2012. ↑ "Ryan Tannehill, Texas A&M profile". Texas A&M Athletic Department. Archived from the original on December 19, 2008. Retrieved October 26, 2008. ↑ Murray, Phil (2008). "2006 District 4-4A Championships". Texas Track. Retrieved December 30, 2015. ↑ "Aggie Offense Clicks Against Cyclones". Texas A&M Athletics. KBTX. October 26, 2008. Archived from the original on July 19, 2011. Retrieved October 26, 2008. ↑ "Ryan Tannehill #17". Rivals. March 3, 2012. Retrieved December 30, 2015. ↑ Grimmer, Sarah (October 20, 2010). "Texas A&M Student-Athlete Spotlight: Jeff Fuller". Big 12 Sports. Retrieved December 30, 2015. 1 2 Zuvanic, Adam (October 31, 2010). "Tannehill leads Aggies to win against Red Raiders". Lubbock Online. Retrieved September 27, 2012. ↑ Riggs, Randy (September 5, 2009). "Aggies will figure out playing time for Johnson, Tannehill". Austin American-Statesman. Archived from the original on June 7, 2011. Retrieved December 30, 2015. ↑ Cessna, Robert (August 18, 2010). "Tannehill juggles his roles well". AggieSports. Archived from the original on August 22, 2010. Retrieved December 30, 2015. ↑ Zwerneman, Brent (August 30, 2010). "Aggies' backup QB invaluable as receiver". San Antonio Express-News. Retrieved September 27, 2012. ↑ "2009 All-Big 12 Football Awards Announced". Big 12 Sports. December 1, 2009. Retrieved December 30, 2015. ↑ Shinn, John (November 2, 2010). "Aggies have their QB now". The Norman Transcript. Retrieved September 27, 2012. ↑ Rieken, Kristie (November 13, 2010). "Gray's 4 TDs lead No. 23 Texas A&M to fourth straight win, 42-30, over Baylor". Los Angeles Times. Archived from the original on November 17, 2010. Retrieved December 30, 2015. ↑ Zwerneman, Brent (October 23, 2010). "Johnson, Tannehill lead A&M by Kansas 45-10". Houston Chronicle. Retrieved December 30, 2015. 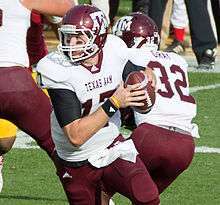 ↑ "QB Ryan Tannehill's record day leads A&M past Tech". ESPN. October 30, 2010. Retrieved September 27, 2012. ↑ Cessna, Robert (October 31, 2010). "He's the man: Tannehill wrecks Tech". AggieSports. Archived from the original on November 3, 2010. Retrieved December 30, 2015. ↑ Burch, Jimmy (November 22, 2010). "Texas A&M expected bigger bounce in polls". Fort Worth Star-Telegram. Archived from the original on December 5, 2010. Retrieved December 30, 2015. ↑ "All-Big 12 Football Awards Announced". Big 12 Sports. November 30, 2010. Retrieved December 30, 2015. ↑ "Ryan Tannehill Stats". ESPN. Retrieved September 27, 2012. ↑ Lester, Sean (March 29, 2012). "Ryan Tannehill runs a faster 40-yard dash than Andrew Luck at A&M Pro Day". The Dallas Morning News. Archived from the original on August 21, 2012. Retrieved December 30, 2015. ↑ "Ryan Tannehill Draft Profile". NFL. 2012. Retrieved September 27, 2012. ↑ Rapoport, Ian (July 28, 2012). "Ryan Tannehill, Miami Dolphins agree on rookie contract". NFL. Retrieved December 30, 2015. ↑ Wine, Steven (August 20, 2012). "Tannehill chosen Dolphins' starting QB". Yahoo! Sports. Archived from the original on August 23, 2012. Retrieved September 27, 2012. ↑ Frenz, Erik (September 10, 2012). "Miami Dolphins: Breaking Down Ryan Tannehill's Interceptions". Bleacher Report. Retrieved September 27, 2012. ↑ Volin, Ben (September 26, 2012). "Talking Points: Miami Dolphins will have to live with Ryan Tannehill's growing pains". The Palm Beach Post. Archived from the original on September 28, 2012. Retrieved September 27, 2012. ↑ Biggane, Brian (September 10, 2012). "Joe Philbin: Offense has to share blame for Ryan Tannehill tips". The Palm Beach Post. Retrieved September 27, 2012. ↑ Rudnansky, Ryan (September 26, 2012). "Reggie Bush: Dolphins Have No Chance vs. Cardinals Without Veteran RB". Bleacher Report. Retrieved September 27, 2012. ↑ Frenz, Erik (October 1, 2012). "Breaking Down Ryan Tannehill's Breakout Performance vs. Cardinals". Bleacher Report. Retrieved October 2, 2012. ↑ Berardino, Mike (September 30, 2012). "Late interception dooms Ryan Tannehill, Dolphins". The Sun-Sentinel. Retrieved October 2, 2012. ↑ Nogle, Kevin (January 3, 2013). "Dolphins Rookie Quarterback Ryan Tannehill Season Review". The Phinsider. Retrieved January 3, 2013. ↑ Kent, Andy (January 15, 2014). "Dolphins Hire Bill Lazor As New Offensive Coordinator". Miami Dolphins. Retrieved May 1, 2015. ↑ Wine, Steven (June 17, 2014). "Tannehill and Dolphins are learning new offense". USA Today. Retrieved May 1, 2015. ↑ Salguero, Armando (May 18, 2015). "Ryan Tannehill signs contract extension through 2020". The Miami Herald. Retrieved May 18, 2015. ↑ Orr, Connor (May 18, 2015). "Miami extends Ryan Tannehill's contract through 2020". NFL.com. Retrieved May 18, 2015. ↑ Perkins, Chris (October 25, 2015). "Dolphins QB Ryan Tannehill has perfect performance in victory over Houston". The Sun-Sentinel. Retrieved December 30, 2015. ↑ Wagner-McGough, Sean (October 25, 2015). "Dolphins' Ryan Tannehill sets NFL record with 25 straight completions". CBS Sports. Retrieved October 25, 2015. ↑ Maaddi, Rob (October 30, 2015). "Brady, Patriots rout Dolphins 36-7 to improve to 7-0". Yahoo! Sports. Retrieved December 30, 2015. ↑ Wine, Steven (December 14, 2015). "Beckham scores 2 TDs to help Giants beat Dolphins 31-24". CBS Sports. Retrieved December 30, 2015. ↑ Grimmer, Sarah (October 6, 2011). "Texas A&M Student-Athlete Spotlight: Ryan Tannehill". Big 12 Sports. Retrieved December 20, 2015. ↑ Volin, Ben (October 12, 2012). "Brains of the operation: Ryan Tannehill's smarts help him adapt quickly as Miami Dolphins QB". Palm Beach Post. Retrieved December 30, 2015. ↑ Alanez, Tonya (January 17, 2014). "Lauren Tannehill, wife of Dolphins quarterback: 'Just an all-around-sweet Texas girl'". Sun-Sentinel. Retrieved December 30, 2015. ↑ Chase, Chris (April 27, 2012). "Ryan Tannehill's wife was the hit of Thursday's NFL draft (PHOTOS)". Yahoo! Sports. Retrieved April 28, 2012. Wikimedia Commons has media related to Ryan Tannehill.